You have to get this right first. 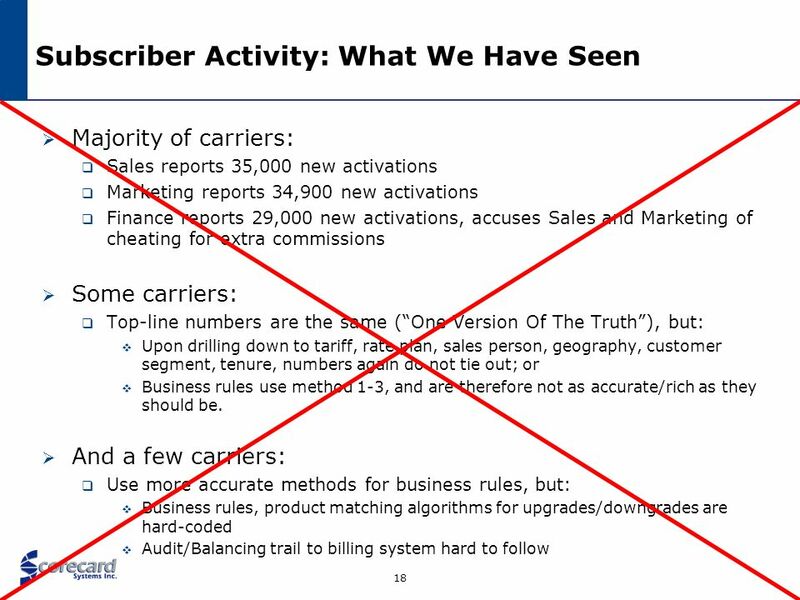 BUT: Most carriers do not accurately capture activations, churn, plan to plan migrations, transfers between landline/wireless phones Most carriers do not accurately capture “customer-focused revenue generating services” and the related activity in their subscriber base. Most executives STILL do not have one version of the truth. 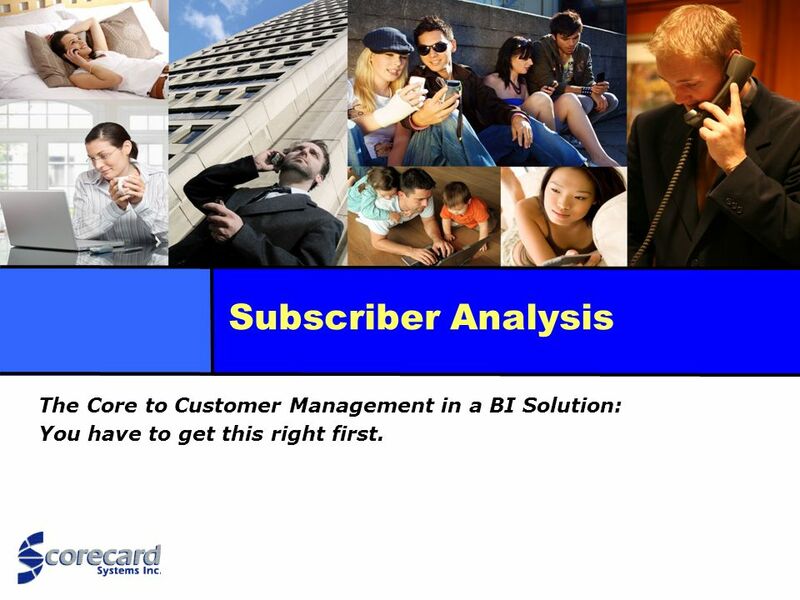 In many cases the result: Use of DW/BI tools is restricted to a core group of analysts or power users. 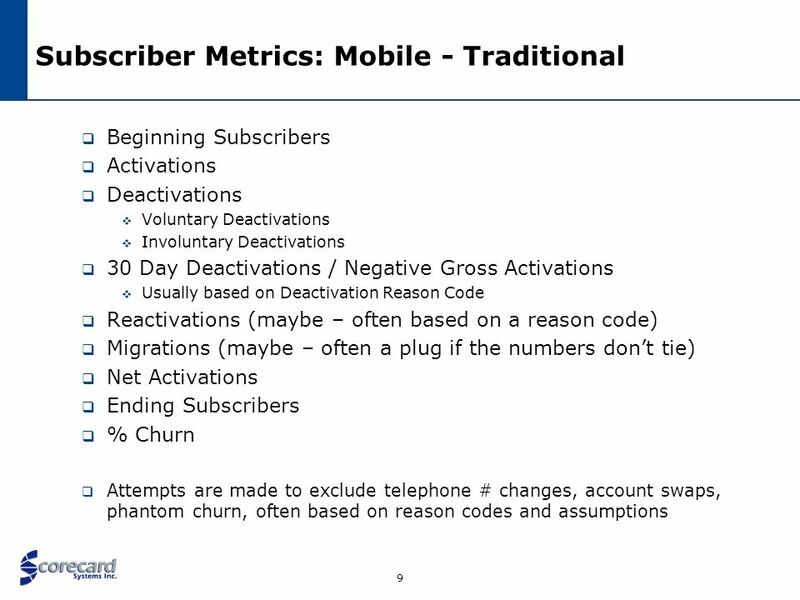 Wide deployment to sales / marketing / finance is restricted due to a lack of trust in the numbers. 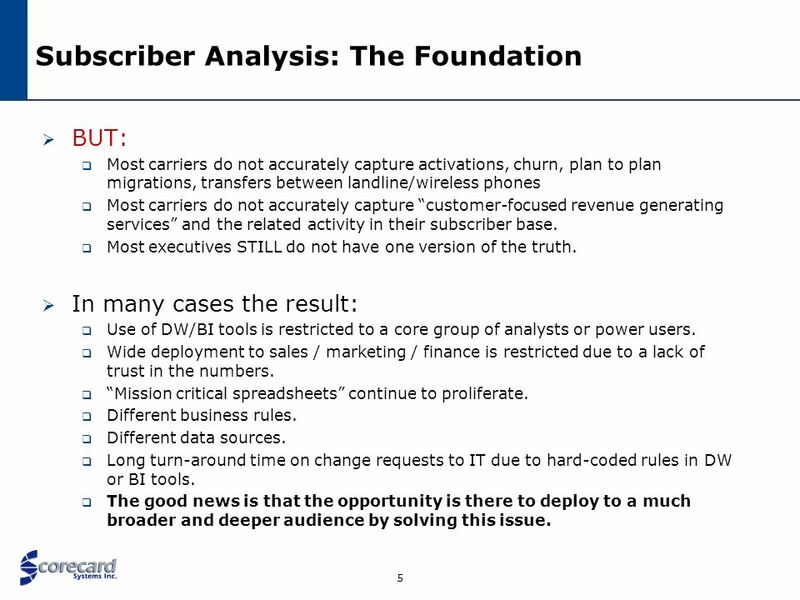 “Mission critical spreadsheets” continue to proliferate. Different business rules. Different data sources. Long turn-around time on change requests to IT due to hard-coded rules in DW or BI tools. The good news is that the opportunity is there to deploy to a much broader and deeper audience by solving this issue. 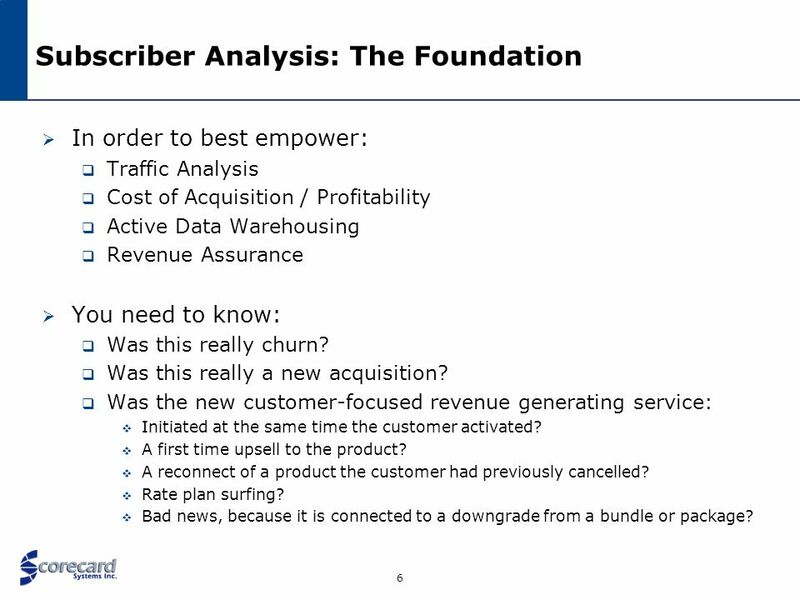 In order to best empower: Traffic Analysis Cost of Acquisition / Profitability Active Data Warehousing Revenue Assurance You need to know: Was this really churn? Was this really a new acquisition? Was the new customer-focused revenue generating service: Initiated at the same time the customer activated? A first time upsell to the product? A reconnect of a product the customer had previously cancelled? Rate plan surfing? Bad news, because it is connected to a downgrade from a bundle or package? 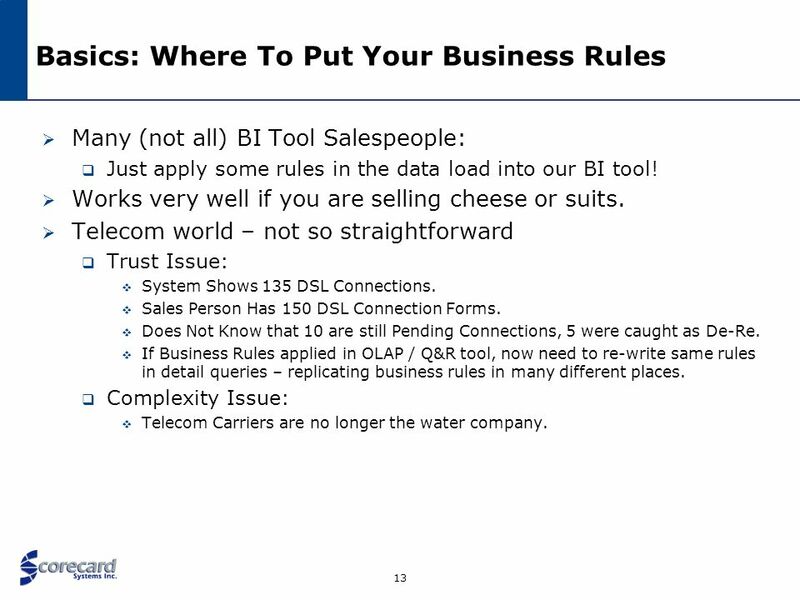 Many (not all) BI Tool Salespeople: Just apply some rules in the data load into our BI tool! Works very well if you are selling cheese or suits. 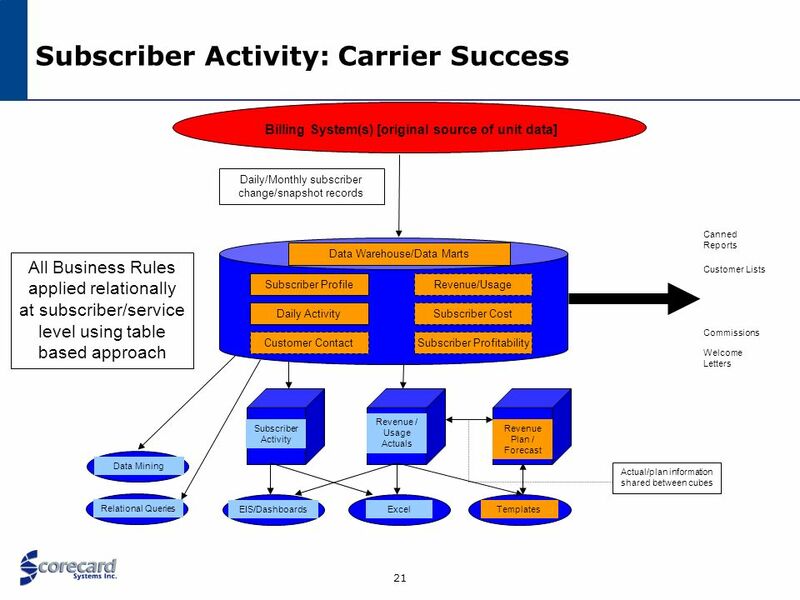 Telecom world – not so straightforward Trust Issue: System Shows 135 DSL Connections. 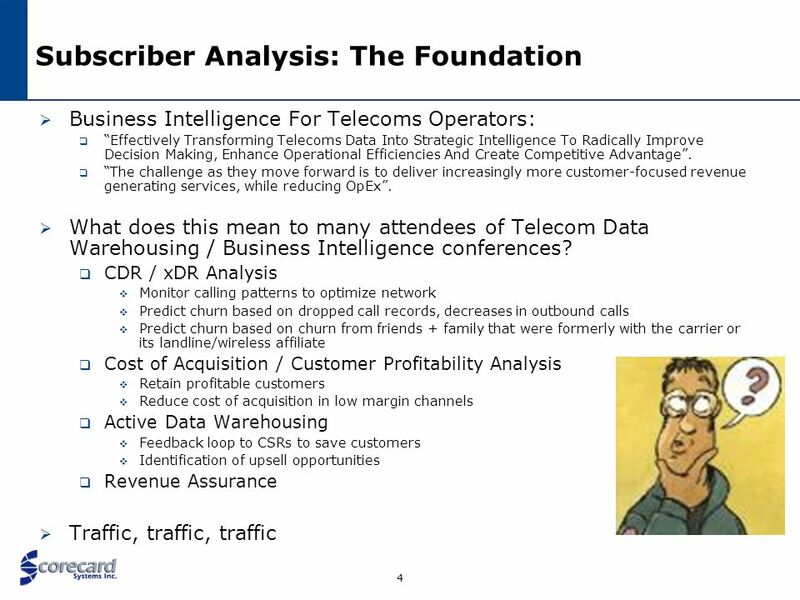 Sales Person Has 150 DSL Connection Forms. Does Not Know that 10 are still Pending Connections, 5 were caught as De-Re. If Business Rules applied in OLAP / Q&R tool, now need to re-write same rules in detail queries – replicating business rules in many different places. 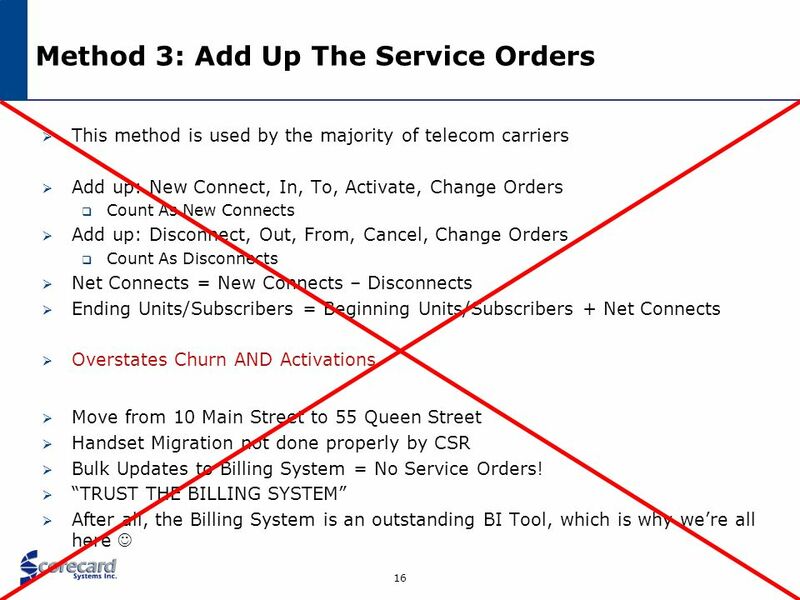 Complexity Issue: Telecom Carriers are no longer the water company. 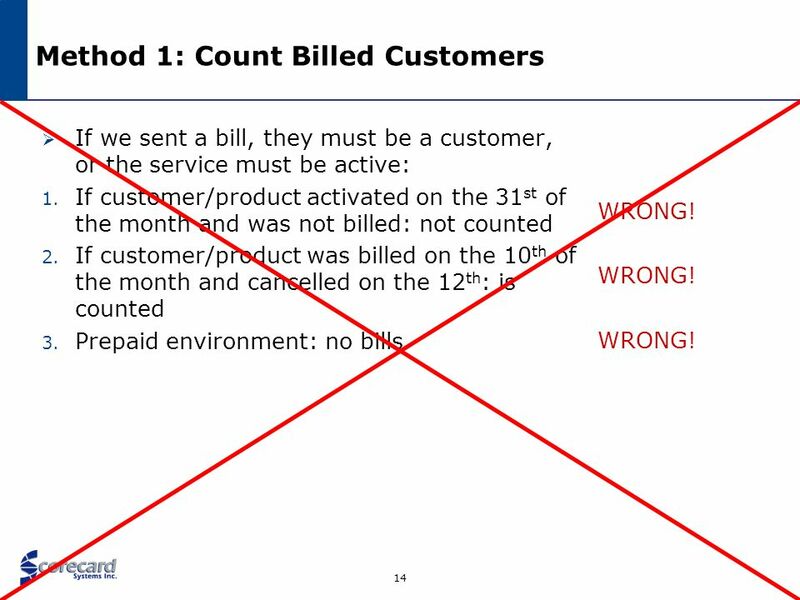 If we sent a bill, they must be a customer, or the service must be active: If customer/product activated on the 31st of the month and was not billed: not counted If customer/product was billed on the 10th of the month and cancelled on the 12th: is counted Prepaid environment: no bills WRONG! WRONG! WRONG! Get rid of all business rules that are not stored relationally. You need to be able to drill back to the customer detail. You need to be able to provide an audit trail back to the source systems. 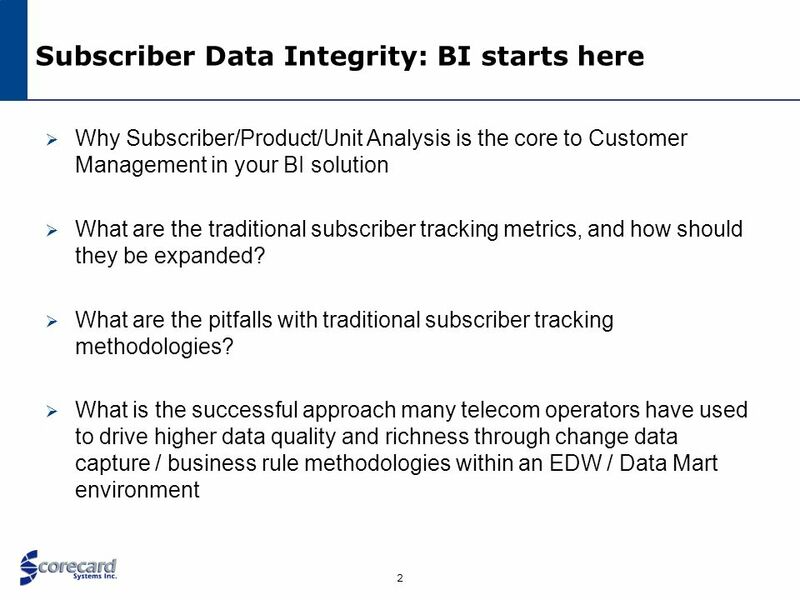 You need to be able to use all of the BI tools that your company has suggested with the business rules stored in one central location. Trust nobody. Do not trust CSRs, Dealers and Sales People. 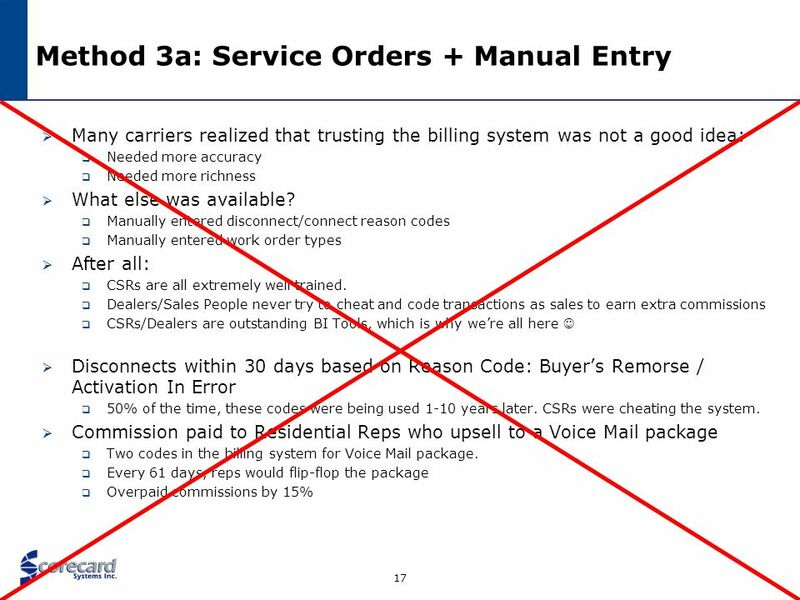 Do not trust the Billing / Service Order System. Do not trust Analysts writing their own business rules. 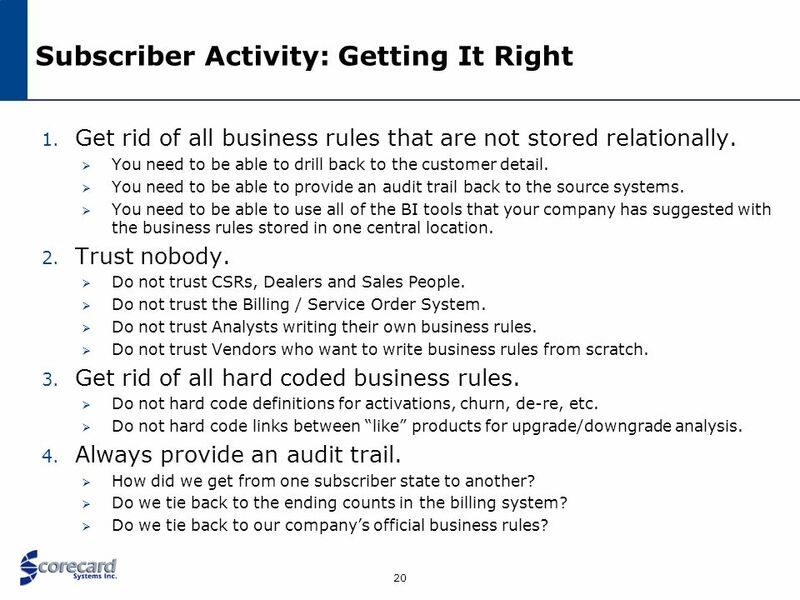 Do not trust Vendors who want to write business rules from scratch. Get rid of all hard coded business rules. Do not hard code definitions for activations, churn, de-re, etc. Do not hard code links between “like” products for upgrade/downgrade analysis. Always provide an audit trail. 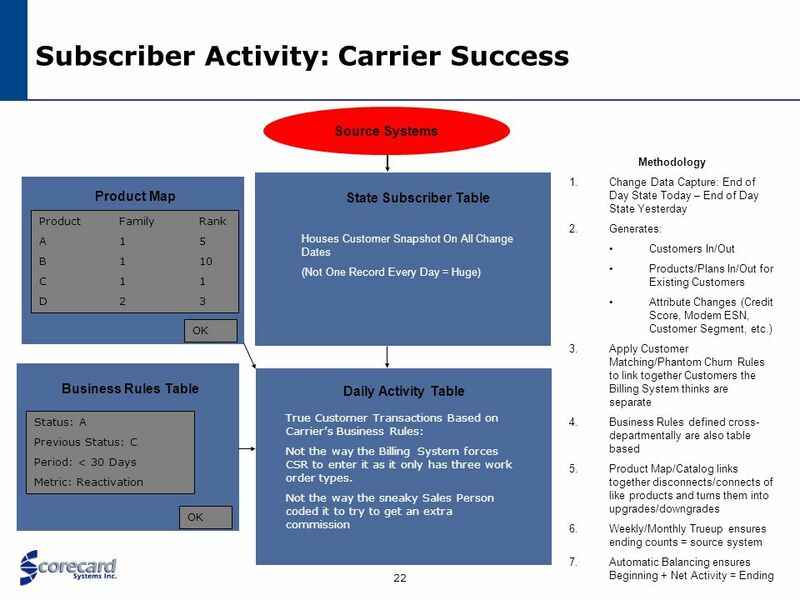 How did we get from one subscriber state to another? Do we tie back to the ending counts in the billing system? Do we tie back to our company’s official business rules? Ability to leverage best practices for subscriber analysis from other telecommunications carriers. 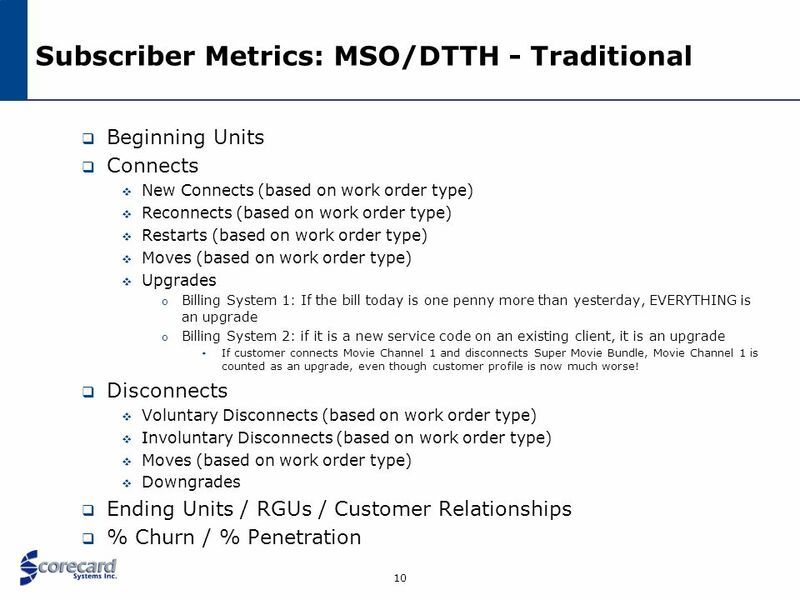 Deployment of solution that will allow for table-based business rule changes rather than requiring IT intervention/coding Implement a superior approach to subscriber activity reporting by eliminating “adding up service order” approach Obtaining deeper insight into subscriber activity (i.e., if 500 new instances of High Speed Data were added yesterday): How many HSD instances were added due to new subscriber connects? 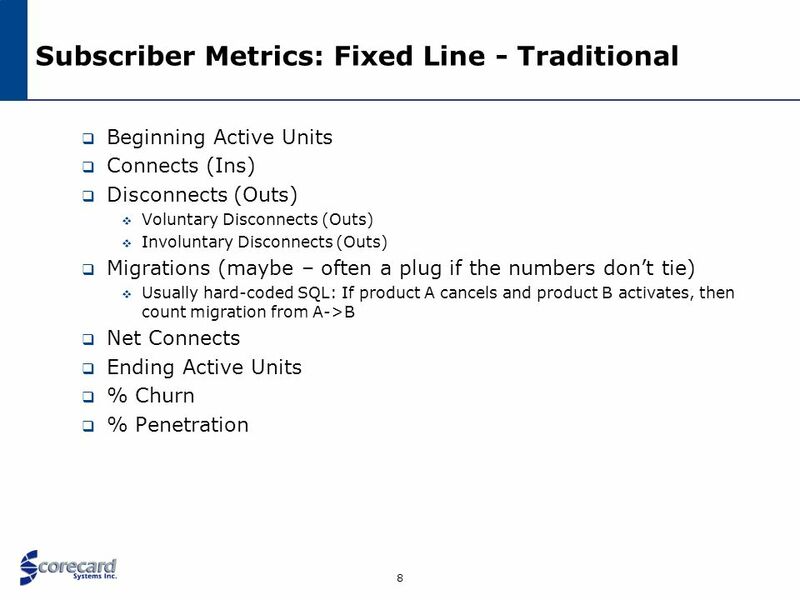 How many HSD instances were added as part of a reconnect? 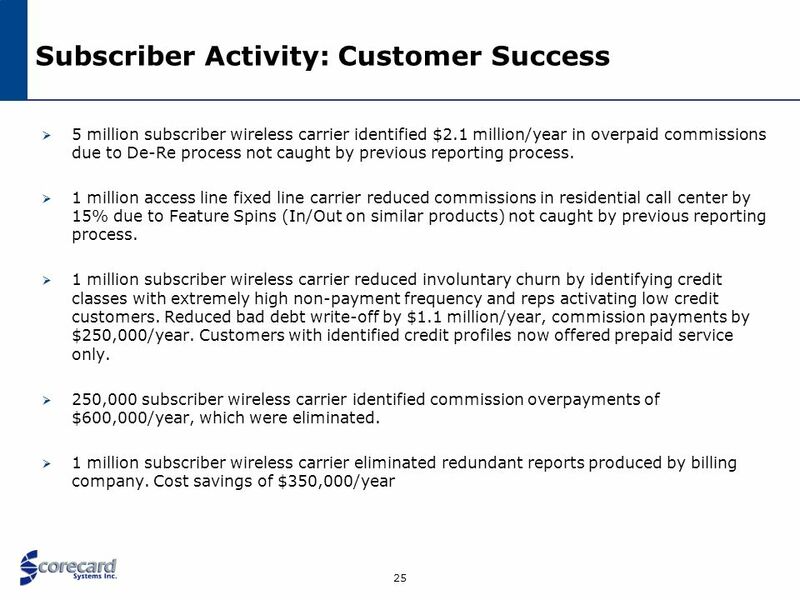 How many HSD instances were added to existing subscribers that formerly had HSD? 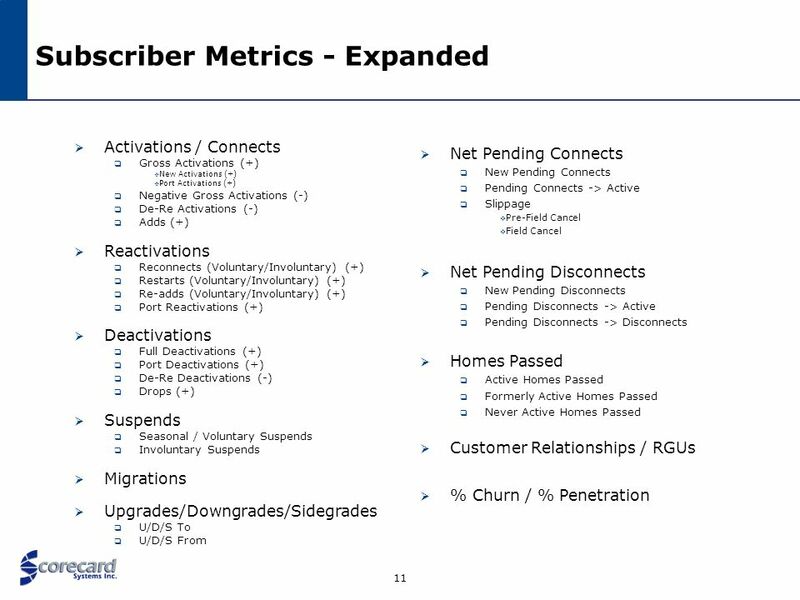 How many HSD instances were added to existing subscribers for the first time? How many HSD instances were added due to a downgrade in service from a internet bundle? Ability to answer questions such as: How many access line disconnects were part of an upgrade to DSL? 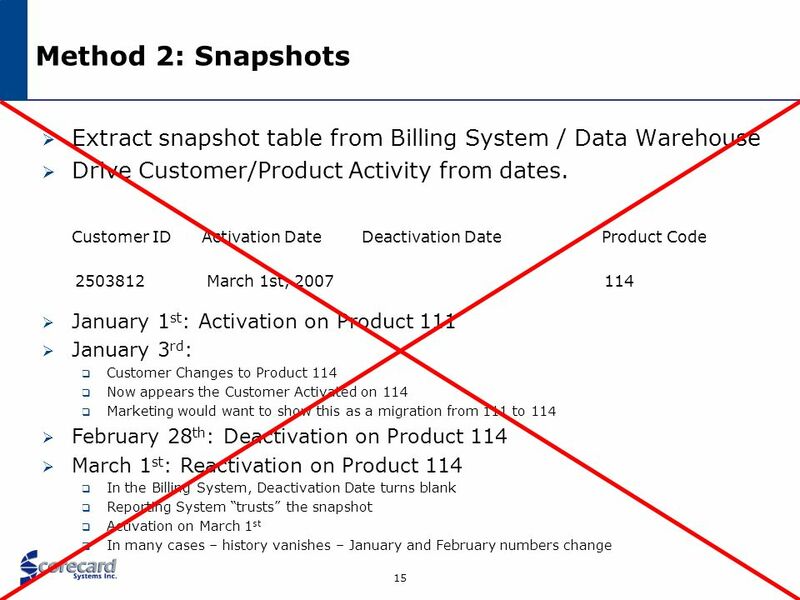 How many customers took advantage of a promotion to activate a new product code, but were simply sidegrades from an existing product (cannibalization) ? How many customers “surf” promotions (connect/disconnect the same product each time a promotional campaign starts/finishes) ? How many customers have a particular product on a la carte basis, either full price, or at a 15% or 25% discount? How many have the same product in a bundle? Providing audit trail for tracking back reported statistics to source data In the event of an audit, or executive questioning the reported numbers, the system will allow users to “track back” the reported numbers through the business rules to the source billing system data. 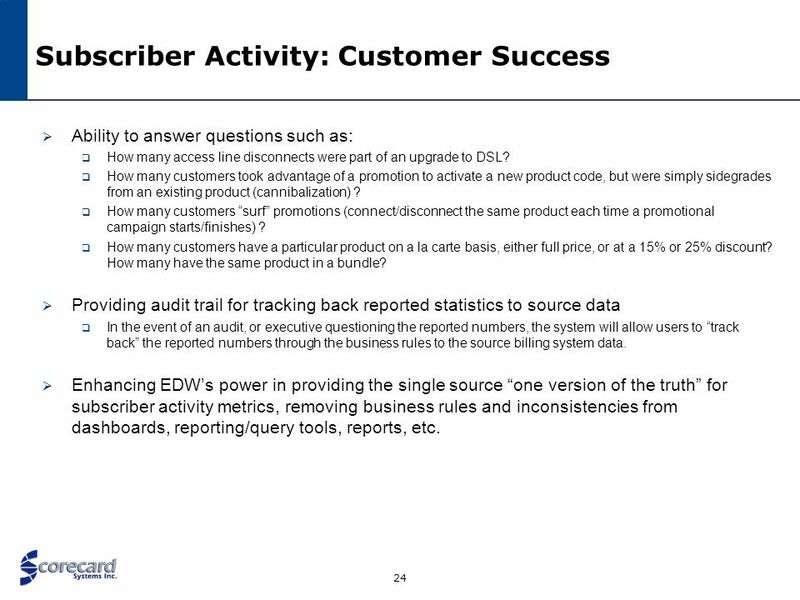 Enhancing EDW’s power in providing the single source “one version of the truth” for subscriber activity metrics, removing business rules and inconsistencies from dashboards, reporting/query tools, reports, etc. 26 Thank You For Your Attention! Download ppt "Subscriber Data Integrity"
MFA for Business Banking – Security Questions with Reset Multifactor Authentication: Quick Tip Sheets Note to Financial Institutions: We are providing. 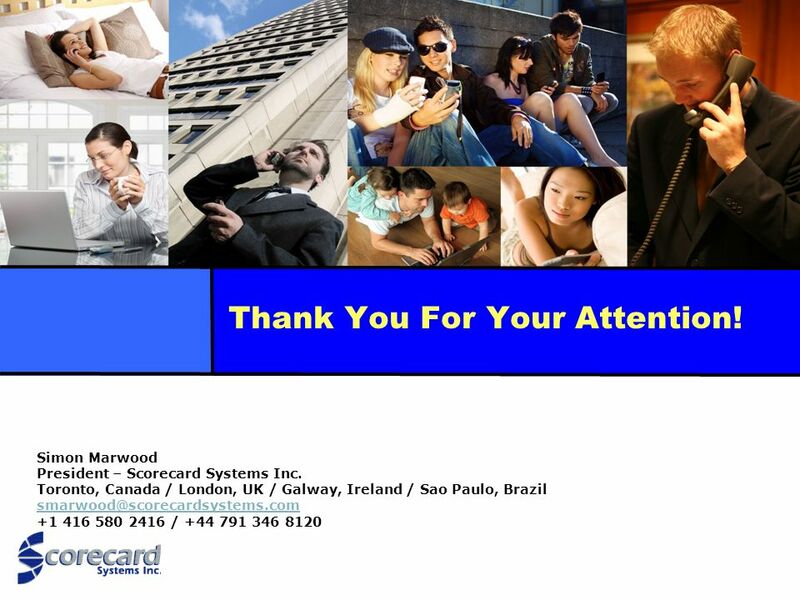 Investor Conference March 2001, Rio de Janeiro 1 This presentation contains statements that constitute forward-looking statements within the meaning of. Follow the instruction to install the PC Suite from the SD card: 1.Go to the settings -> SD Card & phone storage -> Enable the mass storage only mode 2.Connect. Key Telecom/ICT Indicators Esperanza C. Magpantay Market, Economics and Finance Unit Telecommunication Development Bureau 4 th World Telecommunication/ICT. XP New Perspectives on Microsoft Office Word 2003 Tutorial 6 1 Microsoft Office Word 2003 Tutorial 6 – Creating Form Letters and Mailing Labels. EMIS The fun never ends…. 2 Previously… EMIS data -- snapshot submitted once in January, December (special education, CTAE students only), February and. Grants 3.0 Departmental Administrator Review January 22, 2014. YOU ARE LOOKING AT Saadhvi PRESENTATION TOPIC Saadhvi - The Empire of Innovative Technology WE ARE CURRENTLY ON Enterprise Business Solution. Campaign Planning – Direct Wines Using historic data to improve planning and forecasting TFM&A 2014 David Lockwood: Direct Wines Terry Hogan: Golden Orb.